Die-cut sticker printing creates stickers in the shape you choose. First create your design, then print die-cut stickers in the shape and size that fits your idea. This makes these stickers unique to you and your message. 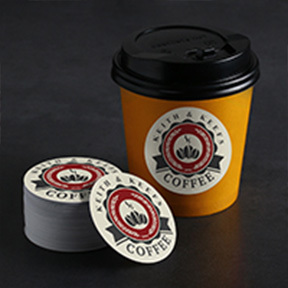 Use die-cut stickers for promoting your brand or a variety of other popular applications including promotional giveaways for bands, sports teams, and larger organizations. They’re easy to apply to any smooth, hard surface. The custom shapes work perfectly for applications where you need your stickers to stand out or fit on a very specific space. Sizes are customized to your specifications, making it possible to create high-quality full color stickers in sizes smaller or larger than the standard options offered by other printers. Die-cut stickers come printed on your choice of paper stock or crack and peel vinyl. Use the vinyl stock for more vibrant colors and applications that require more durability or exposure to rain, weather, sunlight, and abrasion. Use paper stock for a more muted look for normal indoor use. Unlike many printing services, all our print jobs are manually inspected to ensure they’re true to your design specifications. This means your die-cut stickers will always look just as you envisioned them. How are Die-cut Stickers Made? When we make die-cut stickers, special blades are made that punch out custom shapes on sticker paper, similar to how cookie cutters make shaped cookies by punching them into dough. A similar method is kiss-cutting, where the blades only slightly touch the sticker paper so the shapes are cut on the adhesive top layer, but the backing sheet remains untouched. A third type is cutting to size, which just means that stickers are individually cut, rather than staying on sheets or rolls.